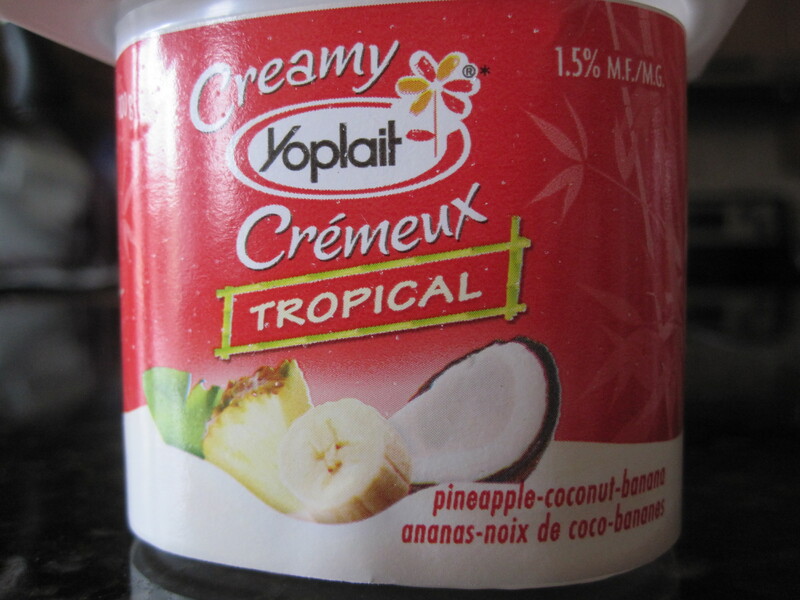 Yoplait’s “pineapple-coconut-banana” yogurt doesn’t contain coconut! 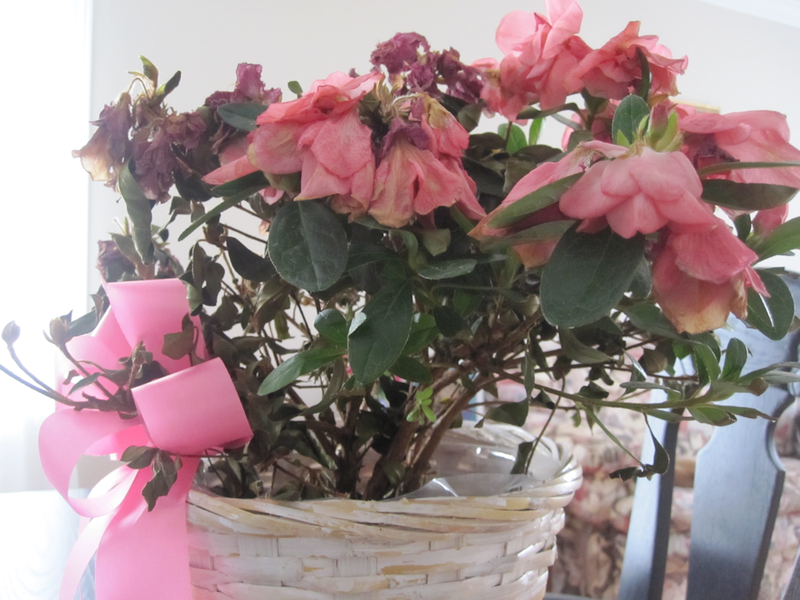 I was living in the now this morning. One of those zen moments. I was sitting peacefully, eating a yogurt. My wife was at the grocery store, my daughter was at her painting class, and my son was still sleeping. Since my brain wasn’t jumping around with various thoughts, I was really tasting the yogurt. “Hmmm, it’s delicious!”, I thought to myself. It was the first time I tried this new flavor. “It tastes like pineapple with a hint of banana…”. “Interesting, the label says pineapple-coconut-banana but I can’t taste the coconut!”. “Let me read the ingredients. 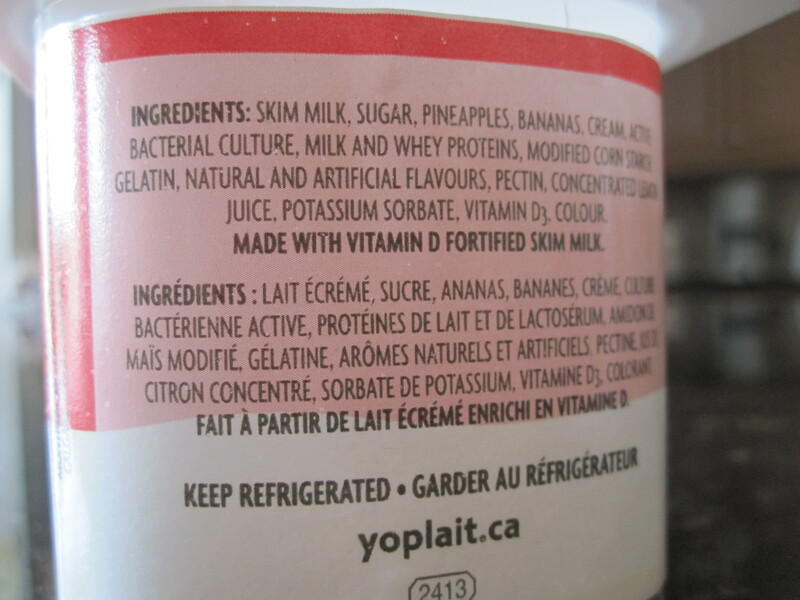 Skim milk (that’s good), Sugar (really, 2nd ingredient), pineapples (yes, that makes sense), bananas (yes, that also makes sense)… Colour”. I got to the last ingredient and realized there was no coconut in the yogurt. None! I guess living in the now does bring us a better perspective of the world around us. Scrum daily stand-up meeting. Can you stand-up for something important today? If you are using Scrum and Agile within your organization, you already know about the daily stand-up meeting and the value its brings to the team. Many organizations who have not fully adopted Scrum still find the stand-up meeting to be extremely useful when done properly – but this is not the objective of this blog post. 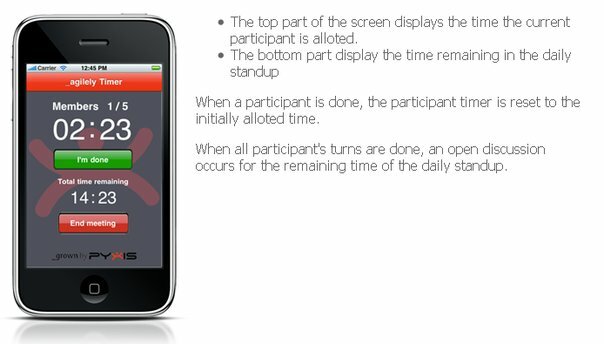 We have just released a really neat ipod touch app – the _agilely Timer. No, this is not a shameless plug but a way to help people in need. 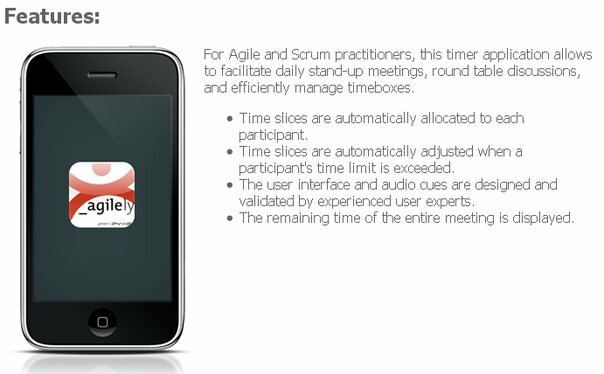 As part of the Agile Tour, Pyxis has released a timer application that allows you to efficiently facilitate daily stand ups, roundtable discussions and manage timeboxes. For only $1.99, this is a great way to help FIAN since all revenues will be donated to this organization that “fights hunger with human rights”. Go ahead, get this neat app and stand-up for something today. Want to know more, you may be interested in this blog post in French or the English version translated by Google. How can someone Join a Community? Can people leave a Community? Everyone can ask to join a community if it is open to integrate new members. Once again, the community decides how many members it will allow and which skill set, profile and experience is required to qualify. Assuming the community is accepting new members, anybody who believes they meet the requirements may ask to join the community. Based on the norms established by the community, people may leave with (or without) advanced notice. Communities are usually fluid and allow for members to join and leave in order to support the emergence of new ideas and new energy to reach the set objectives. In order not to disrupt significantly the activities of the community, members are usually required to provide advanced notice to the other community members. Norms vary for each communities but in our situation there is a fundamental rule that states the “no single individual can have authority over another individual”. As such, community members cannot be expelled or fired based on the decision of a single individual, including the community leader. Community members who fail to comply to the norms and values of their group may be asked to leave if the majority of community members support the decision. As in the case of a voluntary departure, the community is required to provide advanced notice to the member they wish to expel. For more content on the topic of communities, you may follow the community tag. What Rules Do Communities Follow? It is not that communities are disorganized and chaotic but Our Communities do not follow rules as they are currently understood and documented. The Merriam-Webster dictionnary defines rules as “a prescribed guide for conduct or action” or “the laws or regulations prescribed by the founder of a religious order for observance by its members“. By that definition, rules are very strict and typically defined by the leading members of the group. Our communities use norms to organize themselves and ensure common understanding. As per wikipedia, norms “are the rules that a group uses for appropriate and inappropriate values, beliefs, attitudes and behaviors“. Each community defines its set of norms under which they wish to operation. To ensure the community is linked to other communities, the group must ensure their norms are inline with the norms of the greater community to which they belong. Some norms may be identical for all the communities (i.e. freedom of expression) while some communities may have specifics expectations (i.e. specific time commitment). Typically, more norms are required at the early stages of a community to create a common culture and set of values and to prevent abuse. As the community matures, less norms are required and the community self-regulates. It is critical for the norms to be clearly communicated at the entry point in order to avoid misunderstanding and confusion later in time. In the end, the level of freedom and the type of structure used by each community is never as important as the results they achieve. Before going into the organization, the structure, the rules, and the modus operandi of a community, I must start with a definition to allow for a common understanding of what I will be discussing in the various posts on this topic. A community is a group of individuals who share common values and culture, who operate within agreed upon self-defined norms, and that work together to achieve a goal. Members clearly identify themselves as belonging to the community. A community can be composed of smaller communities and communities can be connected together creating a network of communities. 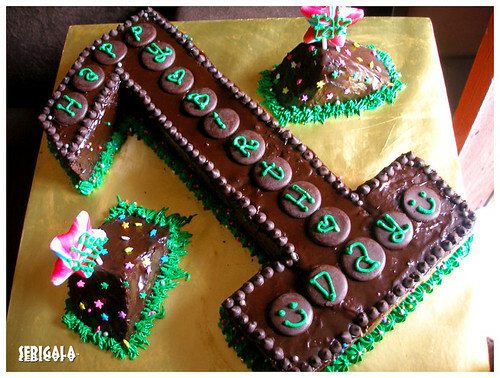 The Open Source movement qualifies as a community. Within the Open Source movement are smaller communities such as the Apache HTTP Server, the Linux operating system, and the Mozilla Firefox browser. Crowdsourcing is another example of a community of individuals coming together to perform a specific task. From an art perspective, Community Theatre is an example of individuals contributing to developing and performing art within a specific context. In an attempt to document an alternate way of structuring for-profit organizations, I will share my thoughts on the structure, the rules, and the modus operandi of communities and attempt to demonstrate they can effectively be used within that context. A few weeks ago, I presented the organizational structure used for our Monthly Strategic Meetings. Since then, I had the opportunity to read: The Answer to How Is Yes: Acting on What Matters, The Starfish and the Spider: The Unstoppable Power of Leaderless Organizations, and The Right Use of Power and attended an interesting session at Agile 2009. As I was walking the kids to school one morning, everything fell into place. Communities could be the new way of structuring organizations. Most organizations are still structured around hierarchies – top-down command and control structures. Some have move towards a matrix type organization and very few organizations adopted other types of structure. As part of an ongoing experiment, we (at Pyxis) are trying to move away from traditional organizational structures while still remaining a profitable organization. Evacuating the financial aspect might allow for even more creative organizational type but generating profit is one of the constraint we are dealing with. In an attempt to provide information about the Community Structure, I will add content in various blog posts over the next few weeks with the objective of documenting what it means to operate an organization as if it was a community of communities. I invite you to share your thoughts and experience on this topic.